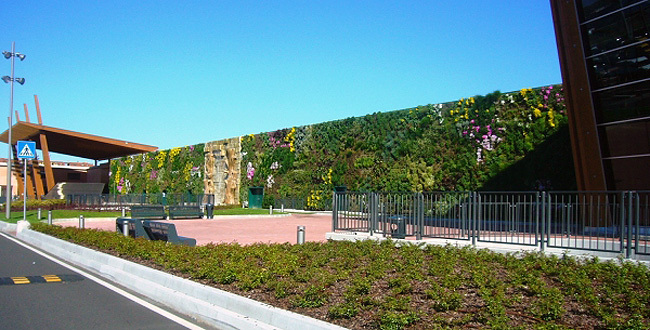 The World’s Largest Living Wall Flourishes With 44,000 Plants at Milan’s Il Fiordaliso Shopping Center! 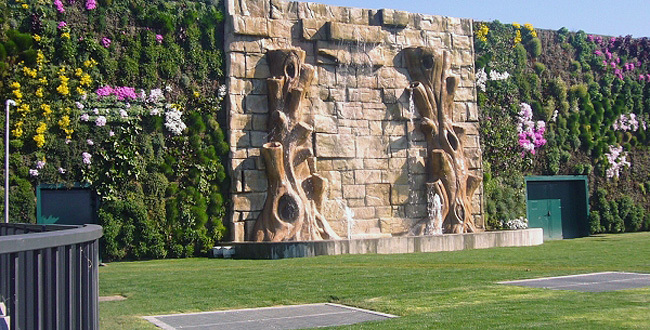 Look out Madrid -- there’s a new contender for world’s largest <a href="https://inhabitat.com/tag/living-walls/" target="_blank">living wall</a> in Milan! 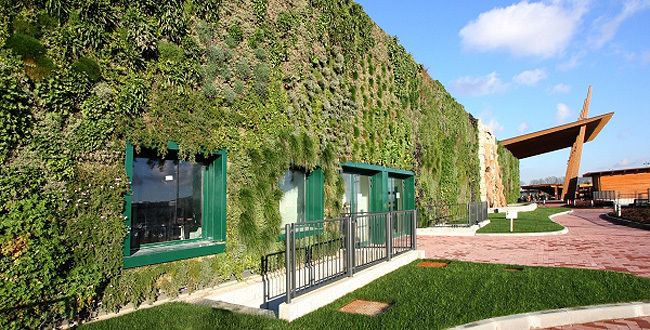 Designed by architect Francesco Bollani, the gorgeous living wall on the side of the <a href="http://www.fiordaliso.net" target="_blank">Il Fiordaliso</a> shopping center was declared the world’s largest by the Guiness Book of World Records. The colorful garden stretches over the walls of the mall, spanning a whopping 13,594 square feet. Bursting with different colors and textures, from mosses to flowering plants, the <a href="https://inhabitat.com/tag/living-walls/" target="_blank">vertical wall</a> covers most of the façade of Il Fiordaliso. Its lush texture not only transforming an ordinary commercial space into a garden oasis, but also gives a better quality of air to the area surrounding the mall. 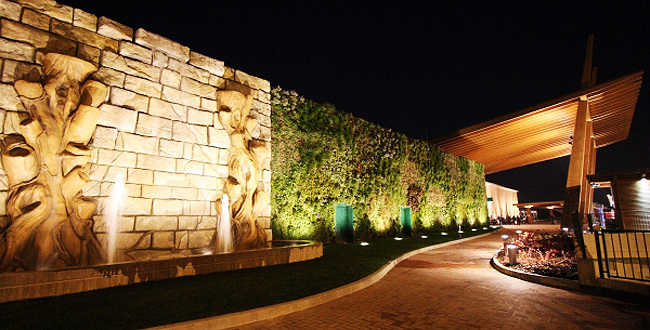 The <a href="https://inhabitat.com/edmonton-airports-beautiful-new-living-green-wall-works-to-clean-the-air/" target="_blank">vibrant wall</a> also cuts down on Il Fiordaliso’s energy consumption, blocking solar gain and insulating in the colder months. The plants also absorb noise and emissions from cars idling in the nearby parking lot. 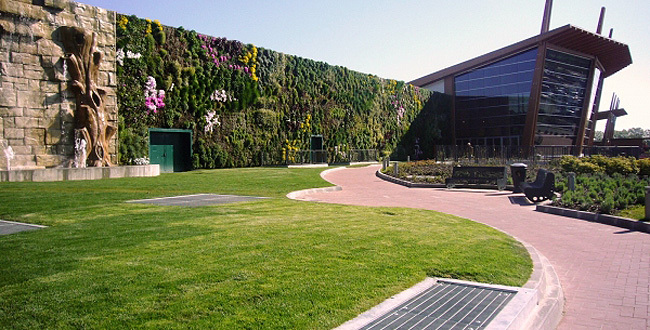 Over 44,00 plants were grown to cover the façade of the shopping center, flourishing for over a year before being relocated to their new home on the wall. Each of the plants took root in supported sections that were assembled like a <a href="https://inhabitat.com/larger-than-life-lego-forest-springs-up-in-australias-living-desert/" target="_blank">big structure of LEGOS</a>, fitting together to create a sturdy system that could be easily irrigated and taken care of. The plants snuggle together in metal containers that allow the roots to thrive. Although a little more expensive than traditional <a href="https://inhabitat.com/the-first-living-wall-in-thessaloniki-greece-flourishes-at-the-i-bank/" target="_blank">vertical gardens</a>, Bollani’s metal container system makes for easier care. Bollani’s gorgeous wall beats out <a href="https://inhabitat.com/patrick-blancs-lush-vertical-garden-is-a-green-oasis-in-the-middle-of-madrid/">Patrick Blanc’s living wall in Madrid</a>, which formerly held the title of World’s Largest Vertical Garden, at 9,084 square feet. 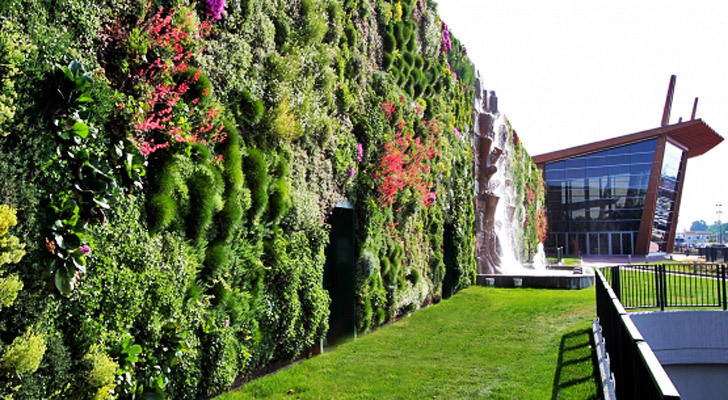 Look out Madrid -- there’s a new contender for world’s largest living wall in Milan! Designed by architect Francesco Bollani, the gorgeous living wall on the side of the Il Fiordaliso shopping center was declared the world’s largest by the Guiness Book of World Records. The colorful garden stretches over the walls of the mall, spanning a whopping 13,594 square feet.